Residents of a Chi nese provincial town Chzhumadyan have an opportunity to see the wonderful dog. We are talking now about a Pinscher named Lu-Lu, who learned to walk on two hind legs, and now she always moves only this way. In addition, as a true lady, she can not go anywhere without her handbag - and her handbag has a shape of a Teddy bear - which she carries on her front leg. The owner of this unusual dog - Guanshan Zhou - said that the training for walking on her hind legs he began with eighteen months old Lu-Lu when she was only four months old. Training was the following: every time when Lu-Lu was going for a walk, her owner was holding her front leg - like with the child. The result exceeded expectations: the dog had become so accustomed to this method of walking that now she is walking always only on her hind legs. In addition, the dog owner says that even to have some rest Lou-Lou does not lie down, she is sitting, leaving her body in an upright position. 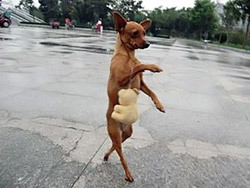 For the local residents Pinscher, who had mastered a human gait became a real celebrity, that everyone wants to capture on photo and treat with something tasty.